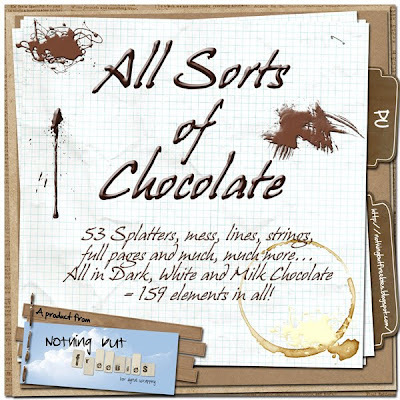 I have gathered a HUGE pack of all sorts of chocolate - splashes, lines, messes, doodles and more - in all three chocolate styles (Dark, Milk & White). 53 elements in each style = 159 pieces of chocolate in all! As the full pack is too big to download I have separated it into 3 packs - one for each style. You find the direct download links under the preview. As mentioned the other day I will now go into rehab to quit my choc-addiction so it will be a few days before you hear from me again. But I will be back so stay tuned. Remember - if you sign up as my follower you will never miss a posting. OMG this is absolutely awesome. I was looking for some fitting stuff to scrap the pictures I toke when I made peppermint bark chocolate, and this is just the thing I need! Thanks so much! Oh,Trine...chocolate lover is not an addiction..it is a life style!!! wow , you have overdone yourself :-) , what a large & beautiful choice of choco stuff , really very realistic . Thank you so much ! I love, love, love the chocolate stuff!! Thank you so much! You're great! /thank you! you are so creative!